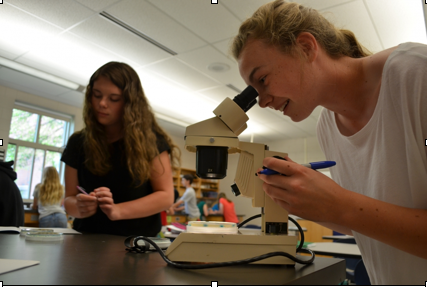 Winnacunnet High students Jenna Roy, left, and Olivia Bessemer, right, examine bacteria they have grown for signs that the cells have mutated and evolved. The biology labs at Winnacunnet High School in Hampton, N.H., smelled like the earthy odor of evolution as summer vacation approached this year. And if a team of teachers and UNH scientists is successful, the pungent aroma will permeate the air in science classrooms across New Hampshire and around the country starting next fall. The odor was created by colonies of harmless bacteria that reproduce and mutate at astonishing speeds, allowing 100 Winnacunnet freshmen biology students to watch evolution unfold before their eyes over the span of a few weeks. But the experiment wasn’t simply a lesson about cell evolution. It was also an example of how UNH is increasing its efforts to evolve K-12 science education itself. Winnacunnet science teachers Mike Handwork ’98 and Shani Scarponi have been working with UNH for more than a year to bring innovative projects and sophisticated new equipment into their classrooms. Handwork spent last summer at the Leitzel Center at UNH, learning how to gather data with his students for Forest Watch, a program that trains K-12 students and teachers to collect data used in studying the health of New Hampshire’s valuable white pine and sugar maple trees. This summer, Scarponi is participating in a similar program. UNH has also loaned Winnacunnet equipment, hosted students on campus and connected the high school’s science faculty with research expertise throughout the university. The idea for the evolution project came from UNH Associate Professor of Microbiology and Genetics Vaughn Cooper, who has been working with graduate student Taylor Warren ’13 to develop a simple, hands-on method of teaching teenagers about the complexities of evolution. The curriculum, called “Evolution in Action,” takes an abstract concept and turns it into a hands-on activity. “It’s a model that allows students to ask and answer and their own questions,” Warren said. Small parts of the process have been used in classrooms before, but Warren’s work at Winnacunnent is the largest and most extensive test so far. The project is supported by a grant Cooper received in 2009 from the National Science Foundation and funding from the New Hampshire Agricultural Experiment Station at UNH; and the work is also allowing Warren to analyize the effectiveness of the curriculum as part of her thesis. At Winnacunnet, the project unfolded during the final weeks of the school year, but the students who participated were too excited by the science to be distracted by the approach of summer vacation. They peered through microscopes and squealed over petri dishes full of murky, squiggly bacteria, counting the different kinds of cell mutations taking place before their eyes. By the time the unit was over, students understood the how and why of evolution and the role it plays in different areas of research. They also gained a better understanding of the scientific method. The program fits into the UNH’s strategy to increase STEM (science, technology, engineering and math) education opportunities for the state’s K-12 students. And if these high schoolers are inspired enough to pursue STEM majors in college, they will then support a goal to double the number of STEM graduates in the state by 2025 – a commitment made in 2012 by the University System of New Hampshire and the Community College System of New Hampshire. Warren was at the high school daily from April until the end of the school year in June, and it showed. Students crowded around her at the lab bench and, during a class discussion, thrust their hands into the air to answer her questions. Handwork and Scarponi were equally grateful for her work. “I’ve been learning with them, which I love,” Scarponi said. This summer, Cooper, Warren and Handwork will review how the project worked at Winnacunnet and create instructional videos for use when school resumes in the fall. The long term goal is to create kits that allow high school students around the country to engage in similar experiments. “We as a group don’t lack for ambition,” Cooper said.